If summer had a taste it would be strawberry lemonade. If summer was a food, it would be these rocket pops! School is out and the kids are home. If you’re like me, you’re looking for things to do that—for the love of Ganesha—don’t involve junk food, constant bickering, or a screen. Cooking can be intimidating with kids, what with the knives and large, open heat source. But getting your kids involved in the kitchen is a great way for them to begin to learn how to cook for themselves and gets them more invested in meal planning and family dinners. Comfort in the kitchen doesn’t require cooking or baking; it starts with getting to know a variety of appliances and utensils. 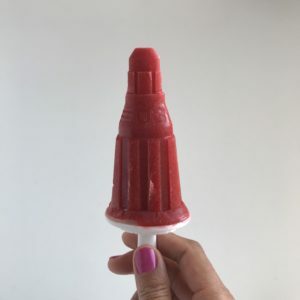 Most kids like to see how things work, and this recipe for strawberry lemonade rocket pops will let them observe the entire process as three simple fruits are transformed into one extravagant treat! These strawberry lemonade rocket pops are a perfect way for your kids to get involved and gain confidence in their culinary abilities. The recipe is simple—only four ingredients—and rewarding. Within a few hours they’ll have a tasty treat you’ll both love: the kids because they’re delicious, and you because they satisfy a sweet tooth without any added dyes, preservatives, or high fructose corn syrup. These are the kind of wins that make summer so sweet! Blend on high until the fruit becomes a puree. Pour into popsicle molds and freeze at least three hours. Add more or less agave nectar to taste. Add slowly…you can always put more in but you can’t take it out! If you like a chunkier pop, stop blending the fruit before it becomes one uniform consistency. Just keep an eye on things until the puree looks right to you. In case you have any leftover puree, add some sparkling water or your favorite fermented beverage for a treat of your own!